Shinya Tsukamoto directs and stars alongside Sosuke Itematsu and Yu Aoi. A young masterless samurai faces a crisis of confidence when he is called upon to defend a family of farmers from a marauding gang in Shinya Tsukamoto’s small scale samurai drama. Killing is the actor-writer-director’s first film since 2014’s remake of Fires on the Plain, and shares a number of stylistic similarities. Young samurai Mokunoshin (Sosuke Itematsu) has been living a quiet and peaceful life, enjoying the hospitality of a peasant family, spending his days training with their adolescent son (Ryusei Maeda). The boy's sister, Yu (Yu Aoi), is developing strong feelings for the young warrior, and hopes he will forgo his desire to join the civil war and perhaps settle down with her. But when master swordsman Sawamura (Tsukamoto), wanders into town, looking to recruit Mokunoshin for the Shogun’s personal guard, this idyllic utopia becomes irrevocably shaken. Sawamura is followed into town by a gang of outlaws, and soon it falls to Mokunoshin to defend his hosts from a violent end. 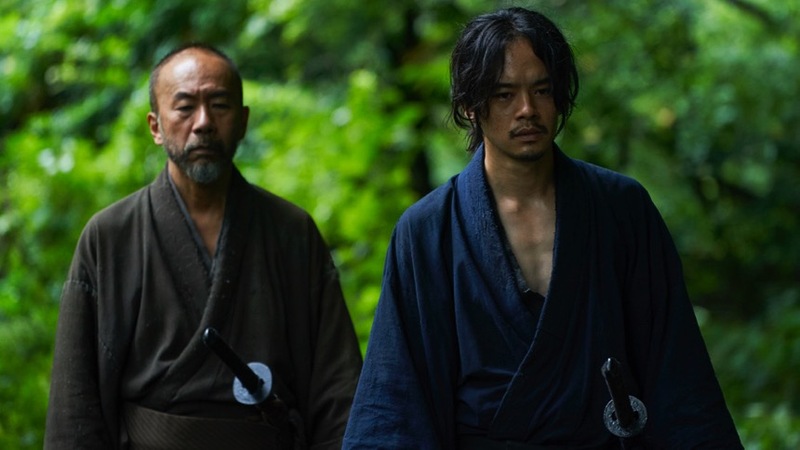 As the film’s title might suggest, Tsukamoto’s latest is a meditation on the nature of killing, when it can and should be justified, and the toil it takes on the lives and souls of those who carry it out. Mokunoshin yearns to become a fearsome warrior, but lacks the disposition to take a life. This self-doubt and internal conflict takes an almighty toll on the character, which the film contrasts against Sawamura’s calm and collected demeamour. Shot digitally on handheld cameras, Killing has a very modern, even somewhat flat visual aesthetic, which the director counters with authentic period detail and a number of attractive compositions. The film opens on the forging of a katana sword, and the film lingers repeatedly on hands gripping their blades, and ceremonial manner in which they are drawn and sheathed. Likewise, the emphatic sound design heightens every minute movement, illustrating just how overbearing every aspect of this lifestyle is for the film’s protagonist, which is further reinforced by Chu Ishikawa’s eerily atmospheric score. The performances are fine across the board, with Tsukamoto projecting an intimidating stillness around which the other principals flutter. Sosuke Itematsu is predictably histrionic as the conflicted young warrior, whose swelling sense of insecurity explodes in an almost hallucinatory fever. His sparring sequences with Maeda are choreographed wonderfully, contrasting effectively with the fast and brutal battles in the film’s second half. The flashes of violence, when they do occur, are gruesomely over the top, as is Tsukamoto’s want. The ever reliable Yu Aoi runs the gamut from bashful admirer to scorned avenger as her hapless peasant girl is put through the physical and emotional ringer by the men in her life. She insists Mokunoshin promise her he will not die before he heads off to war, only to demand that it be he who avenges her family after they are attacked by the villainous outlaws. Killing is not a subtle film by any stretch, and even at just 80 minutes, does labour its simple point - that murder is bad, and it is better to retain our humanity than become a remorseless killing machine. For the most part, however, Tsukamoto has delivered a bold, evocative film that is propelled by a raw, desperate energy and resonates like the work of a much younger artist, and proves never less than wholly engrossing.